Instagraming My Coffee Consumption in the Buckeye Capital. On an early morning recently during the holiday season I decided to take a day road trip and coffee shop hop in Columbus, Ohio. While there I Instagramed my coffee consumption in the Buckeye state capital. It was time to go to a place with atmosphere within to do some travel writing. There isn’t a better place in town for that then Stauf’s Coffee Roasters in the Grandview Heights neighborhood. Upon entering you’ll notice their space is divided evenly between a cafe and a retail storefront, both offering plenty of seating options. For coffee, I went with appropriately named “The Buckeye”. Peanut butter and chocolate coffee deliciousness. Tip: The place fills up fast and there are not a lot of outlets, so if you’re looking to get work done, get there early. Their wi-fi is great even with the traffic. 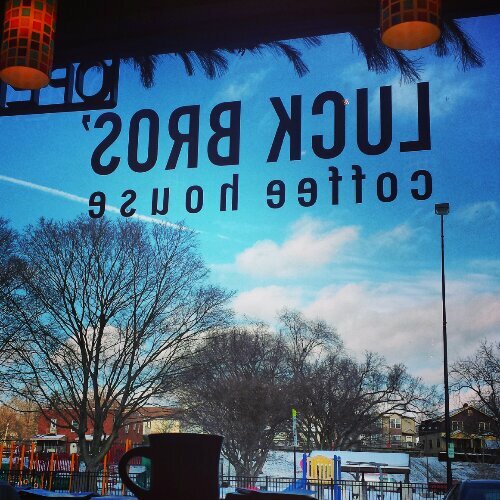 Right after lunch I moved right down the street, staying within the Grandview Heights neighborhood, to Luck Bros’ Coffee House. It’s off the beaten path and provides a quieter alternative to Stauf’s. It little longer to get my pour over, but that was because of the great care they took in making an individualized coffee. I enjoyed the Guatemala Pour Over while also checking out the neighborhood right outside. Each person there made sure I was satisfied with my coffee choice. Whenever traveling, no matter the itinerary, I always seem to wind up somewhere random and unplanned. This day was no exception. Later in the afternoon I decided to take a coffee break and visit the foodie paradise known as North Market. Whether buying food for home or looking for something local to eat, this market in the Short North section of town is the place to be. Passing one delicious food stand after another I wound up at, surprise, surprise, a coffee shop stand within the market called A Touch of Earth. The java and I always seem to find each other. I sat on a stool at the counter and went seasonal enjoying a Pumpkin Cappuccino while people watching. Lots of conversion was also had with the baristas about coffee, the market, the weather and whatever else was going on that day. Other customers were ordering pumpkin and other various types of lattes. Something for next time! You’ll also find a good loose tea selection along with chocolates, candy and other snacks. Throughout the year of 2013 my goal was to visit one-hundred non-chain independent coffee shops. My last stop of the day in Columbus happened to be stop #100 for the year. Cafe Brioso was the lucky spot right in the heart of Downtown. The lucky drink was the Ohio Maple Latte, just one of the many unique coffee drinks on the menu. A delicious way to complete the day and year in coffee drinking. When Cafe Brioso is brought up, their salads and lunch are often mentioned, along with coffee. I should start a series on the food of coffee shops. Hmmm. I consumed food from home on this day. The evening rush was beginning and it was getting darker outside, so it was a good time stop the coffee flow and start the several hour drive back home. Of course I would have no issues staying awake with the amount of caffeine consumption. It was a great day in the Buckeye state capital and I look forward to getting back and exploring more of their thriving coffee scene. Any coffee shop recommendations in Columbus or through out the state of Ohio? What cities would you say are coffee shop hopping worthy that you have come across in your travels? 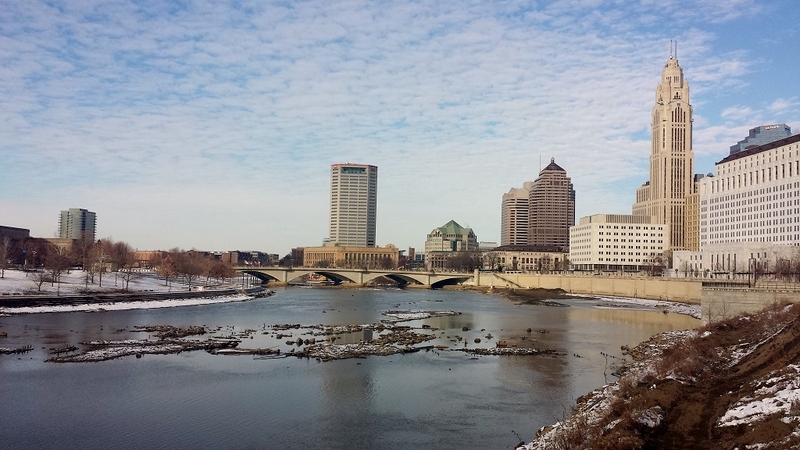 Photo(s) of the Week: An Ohio Buckeye Skyline. 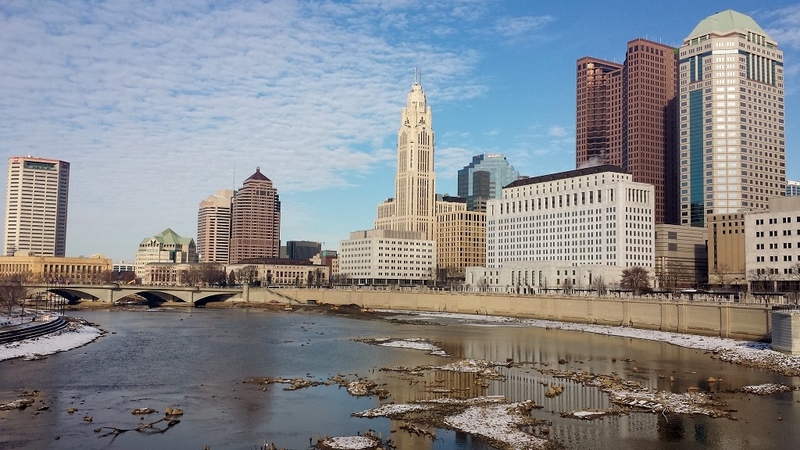 Hanging out over the Scioto River on the Rich Street Bridge, you can get some great pictures of the Columbus, Ohio skyline. 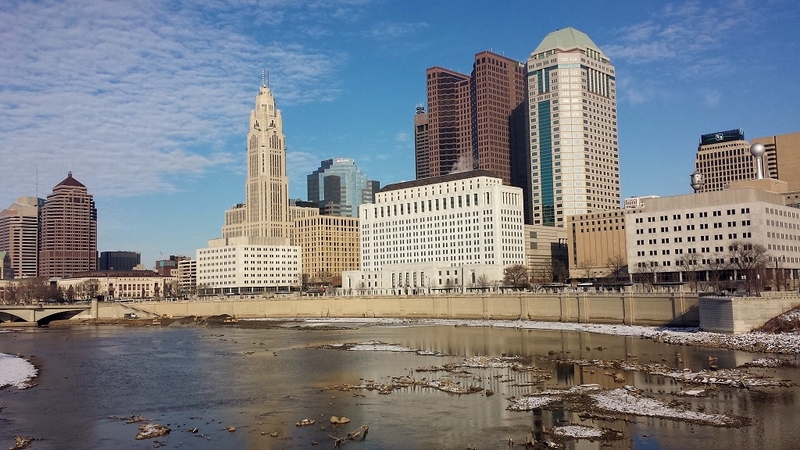 Columbus is the capital of the Buckeye State and home to The Ohio State University Buckeyes.